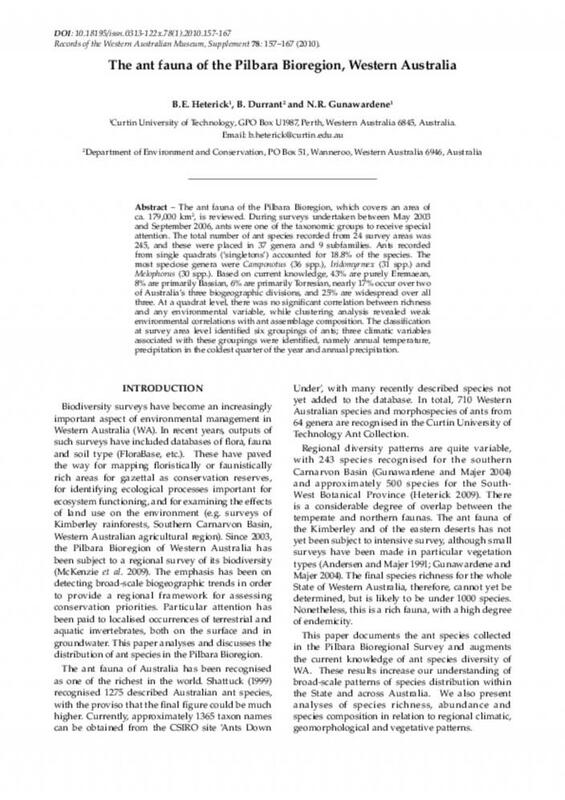 ABSTRACT – The ant fauna of the Pilbara Bioregion, which covers an area of ca. 179,000 km2, is reviewed. During surveys undertaken between May 2003 and September 2006, ants were one of the taxonomic groups to receive special attention. The total number of ant species recorded from 24 survey areas was 245, and these were placed in 37 genera and 9 subfamilies. Ants recorded from single quadrats (‘singletons’) accounted for 18.8% of the species. The most speciose genera were Camponotus (36 spp. ), Iridomyrmex (31 spp.) and Melophorus (30 spp.). Based on current knowledge, 43% are purely Eremaean, 8% are primarily Bassian, 6% are primarily Torresian, nearly 17% occur over two of Australia’s three biogeographic divisions, and 25% are widespread over all three. At a quadrat level, there was no significant correlation between richness and any environmental variable, while clustering analysis revealed weak environmental correlations with ant assemblage composition. The classification at survey area level identified six groupings of ants; three climatic variables associated with these groupings were identified, namely annual temperature, precipitation in the coldest quarter of the year and annual precipitation.